Another hit-based option for hockey collectors, 2016 Leaf Genesis Hockey marks the debut for the brand as it looks across the entire history of the sport. Each hobby box includes eight hits. 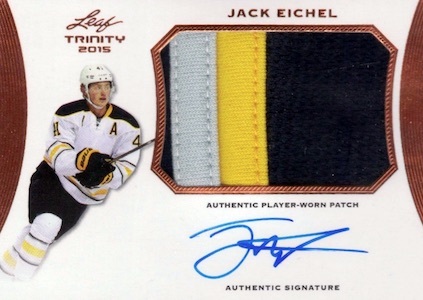 Split into autographs or relics, hit cards in 2016 Leaf Genesis Hockey feature multiple themes. Starting with the signed options, Auto Jersey and Auto Patch rely on the potential stars of hockey's future. 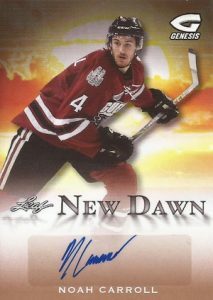 New Dawn highlights top young names like Jack Eichel, Joe Veleno and Nolan Patrick with a sunrise design while Signs of Nobility pays homage to the all-time greats such as Gordie Howe. 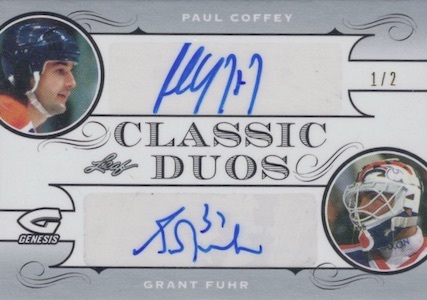 Doubling up the autographs, Classics Duos combines two legends on the same card. 2016 Leaf Genesis Hockey provides ample relic coverage as well. Epic Materials and Patches showcase top CHL talent with a jumbo swatch, Hockey Lore revisits all-time greats, and Origins of Hockey goes back to the beginning with the earliest legends. 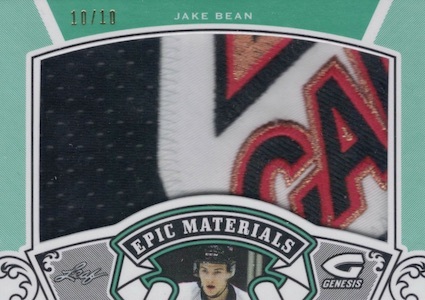 There are also several multi-player relics in 2016 Leaf Genesis Hockey. 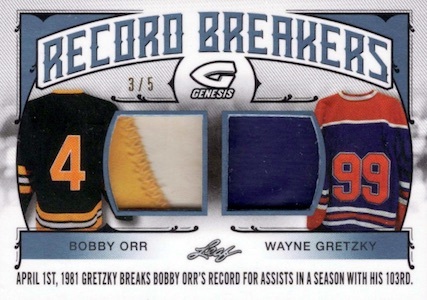 Offering two player relics on one card, Record Breakers includes the original record holder and the later player who broke said record and Classic Rivals goes with notable on-ice enemies. Working with a quad relic, Forefathers celebrates those that paved the way. Franchise Legacy concentrates on current and former players from the same team with an eight-player card. All base versions are Bronze unless noted otherwise. 4 cards. Serial numbered #/4. plates dont count as 1/1s ..hate the plates..